Annexin V assay analyzing stages of apoptosis 48 h following drug treatments [BKM120 (2 μM)] for U87Mg cells; Experiments were repeated 3 times. The mean ± SEM from at least 2–3 independent experiments containing 4 replicates each were obtained. Students t test was used to determine significance (p < 0.05) between groups. AV annexin V, PI propidium iodide. 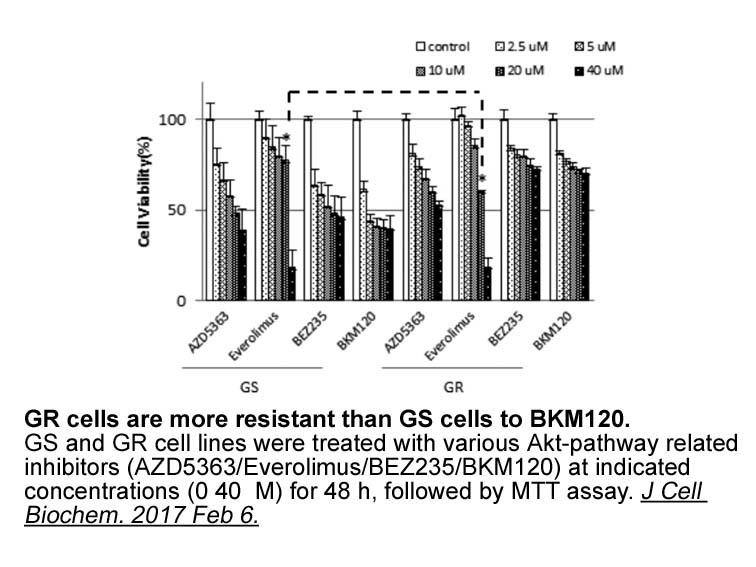 BKM120 almost completely blocked the phosphorylation of Akt at concentration of 2.5 μM. High concentrations of BKM120 such as 5 μM and 10 μM induced cell death. Method:Western Blot; Cell Lines:Primary HUVECs; Concentrations:2.5 μM; Incubation Time:2 h.
 Sahin I, Azab F, Mishima Y, Moschetta M, Tsang B, Glavey SV, Manier S, Zhang Y, Sacco A, Roccaro AM, Azab AK, Ghobrial IM. Targeting survival and cell trafficking in multiple myeloma and Waldenstrom macroglobulinemia using pan-class I PI3K inhibitor, buparlisib. Am J Hematol. 2014 Jul 24. 1. Effects of PI3K inhibitor NVP-BKM120 on acquired resistance to gefitinib of human lung adenocarcinoma H1975 cells. J Huazhong Univ Sci Technolog Med Sci. 2013 Dec;33(6):845-51. doi: 10.1007/s11596-013-1209-5. Epub 2013 Dec 13. 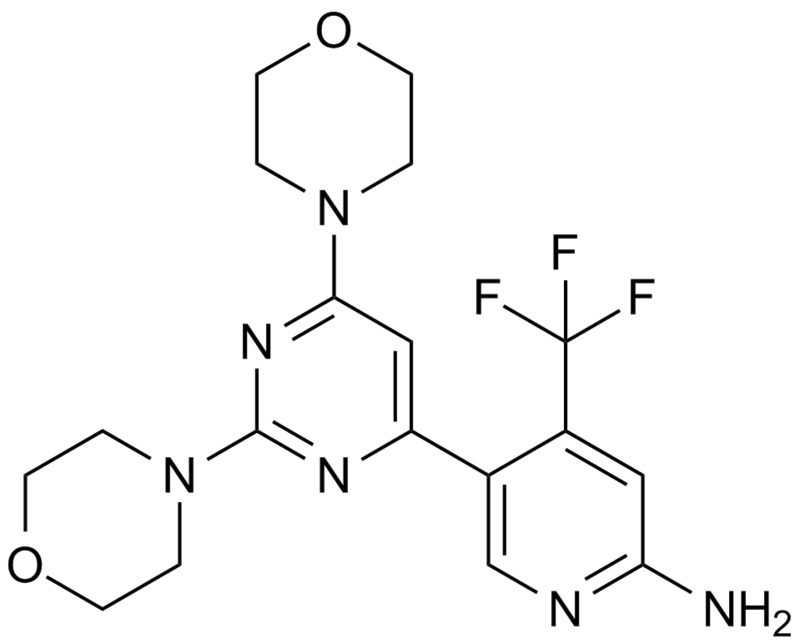 NVP-BKM120, a class I PI3K inhibitor, concentration-dependently inhibited the growth of H1975 cells, which increased the proportion of H1975 cells in G0-G1 phase at 1 umol/L and promoted apoptosis at 2 umol/L. Moreover, NVP-BKM120 overcame acquired gefitinib resistance in H1975 cells though down-regulation of phosphorylated protein in PI3K/AKT signal pathways, including Akt, S6 and 4E-BP1. 2. The phosphatidylinositol-3-kinase inhibitor NVP-BKM120 overcomes resistance signals derived from microenvironment by regulating the Akt/FoxO3a/Bim axis in chronic lymphocytic leukemia cells. Haematologica. 2013 Nov;98(11):1739-47. doi: 10.3324/haematol.2013.088849. Epub 2013 Jul 12. NVP-BKM120 is an orally-available inhibitor of class I phosphatidylinositol-3-kinase that promoted mitochondrial apoptosis in chronic lymphocytic leukemia primary cells through blocking phosphatidylinositol-3-kinase signaling, decreasing Akt and FoxO3a phosphorylation and inducing Bim expression. NVP-BKM120 disrupts phosphatidylinositol-3-kinase pathway in chronic lymphocytic leukemia primary cells by inhibiting microenvironment signals, including B-cell receptor- and stroma-dependent Akt pathway activation, B-cell receptor stimulation induced chemokines secretion and CXCL12 triggered cell chemotaxis and actin polymerization upon CXCR4. 3. Inhibition of pan-class I phosphatidyl-inositol-3-kinase by NVP-BKM120 effectively blocks proliferation and induces cell death in diffuse large B-cell lymphoma. Leuk Lymphoma. 2014 Feb;55(2):425-34. doi: 10.3109/10428194.2013.806800. Epub 2013 Jul 25. Inhibition of PI3K/Akt/mammalian target of mTOR signaling pathway by NVP-BKM120, a pan-class I PI3K inhibitot, in DLBCL cells results in decreased cell proliferation, increased apoptotic cell death, increased expression of Puma and Bim and down-regulation of Bcl-xL and Mcl-1. 4. The PI3 kinase inhibitor NVP-BKM120 induces GSK3/FBXW7-dependent Mcl-1 degradation, contributing to induction of apoptosis and enhancement of TRAIL-induced apoptosis. Cancer Lett. 2013 Sep 28;338(2):229-38. doi: 10.1016/j.canlet.2013.03.032. Epub 2013 Apr 2. BKM120, a PI3 kinase inhibitor, induced apoptosis and enhanced TRAIL-induced apoptosis in human lung cancer cells through facilitating Mcl-1 degradation involving a GSK3/FBXW7-dependent mechanism. BKM120, an orally-available pan-PI3K inhibitor, has the potential to treat T-ALL for its abilities to induce G2/M phase cell cycle arrest and apoptosis T-ALL cells and patient T lymphoblasts, significantly delay tumor growth in a subcutaneous xenotransplant model of human T-ALL and synergize with chemotherapeutic agents for treating T-ALL patients.